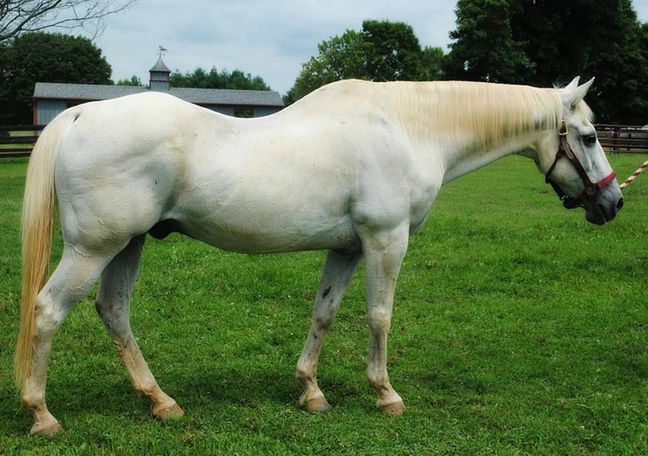 Bruno is a grey 1984 Quarter Horse gelding who came to ERL in December 2013. He is a quiet gentleman and Ivy's doting husband. Bruno stands quietly for all kinds of attention and is always a gentleman to handle. He is a lovely horse with many years of love and fun to offer, but as a senior citizen he has special needs - he requires three meals a day of a soaked complete feed and cannot have hay as he quids, due to the condition of what is left of his teeth. Although he requires a little senior management, Bruno's adoptive family will receive the sweet love and appreciation only a senior equine offers.